The oilseed industry is a strong and vital participant in the U.S. economy. Oilseeds are highly versatile crops and are grown on more than 90 million acres. The worldwide demand for oilseeds and their products increases every year, fueled by increasing populations, as well as improving standards of living. Oilseed products, which are used extensively by consumers in every culture, greatly enhance the quality and nutritional value of everyday human foods and animal feeds. As a renewable resource, oilseeds are also increasingly used in a wide variety of non-food applications, including renewable fuels. Today, oilseed and oilseed product exports not only strengthen America’s balance of trade, but also provide cost-effective solutions to the nutritional and industrial needs of a rapidly increasing world population. The widely cultivated soybean far exceeds all other oilseeds currently in production. Soybeans are grown and used in food production and industries throughout the world because they are high in yield and easy to grow. In recent years, the cultivation of other oilseeds has also grown. Today, canola, flaxseed, safflower, and sunflower have found expanding new markets for a variety of food and non-food uses. NOPA’s mission is to assist the U.S. soybean, canola, flaxseed, safflower seed and sunflower seed processing industries to be the most competitive and efficient in the world by utilizing the combined expertise, knowledge, and resources of its members to foster market- and science-based policies. Each of these oilseeds, and the products derived from them, are discussed below. Though first introduced in the United States as a hay crop in the 19th century, soybeans have been a food crop in Asia for 5,000 years. Soybean processing is one of the world’s oldest industries. Asians first brought the practice of processing soy to the United States, where crude oil processing began with imported soybeans in Seattle, Washington, in 1911. By the beginning of World War I, the new industry began to expand, primarily on the East Coast. By 1922, the soybean processing industry had spread to the Midwest with the opening of the first U.S. plant built solely for crushing soybeans in Decatur, Illinois. During World War II, soybeans earned their reputation as a “miracle crop.” Soybeans have helped to feed a nation increasingly dependent on domestic food sources. From 1940 to 1943, harvested acres of soybeans more than doubled, from 4.8 million acres to 10.4 million acres, respectively. But, this was only the beginning. The next seven decades have witnessed a continued increase in production, wholly unexpected by the most optimistic agricultural forecasters. A growing and more affluent global population, consuming increasingly larger quantities of poultry, eggs, pork, beef, and dairy products, has fueled the skyrocketing demand for soybean meal used in animal feeds. In addition, consumer demand in China, Europe, Southeast Asia, and the developing world continues to create solid export market opportunities for soybeans and soy products. As a result, soybeans are the most important source of vegetable protein and edible oil in the world today. The U.S. soybean industry has responded to this need. In 2014, U.S. soybean growers harvested over 83 million acres of soybeans and produced more than 3.97 billion bushels (108 million metric tons) for the domestic and international markets. 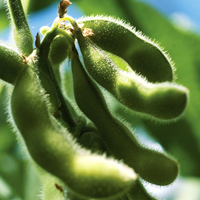 The U.S. soybean processing industry, which converts soybeans to edible food products, animal feed ingredients, and biofuels, has grown to more than 60 plants, operated by 16 companies, and located in 20 states. Virtually all of these companies are members of NOPA. U.S. soybean processing capacity has increased with the increasing global demand. By 2014, the annual “crush” of soybeans—separating the oil from carbohydrates—reached 49.1 million metric tons, up from 47.1 million metric tons in 2013. Soybeans represented 59.3% of the world’s oilseed production in 2014. For the same period, the United States provided over 34% of global soybean production. Today, the U.S. soybean crop is grown on more than 83 million acres in 31 states. After harvest and throughout the year, beans are shipped directly from storage elevators by truck, rail, or barge to processing facilities that crush nearly 45% of the nation’s soybean production, with the balance exported as whole beans or carried over to the next year. In the processing or “crushing” of soybeans, the beans are first cleaned through a succession of screens to remove foreign material and loose hulls. The cleaned beans are then dried, cleaned again, cracked, and dehulled. These cracked beans are then conditioned (heated) and rolled into flakes. At this point, the oil is removed from the flakes by a solvent wash in an extractor. The soybean oil is then separated from the solvent mixture. 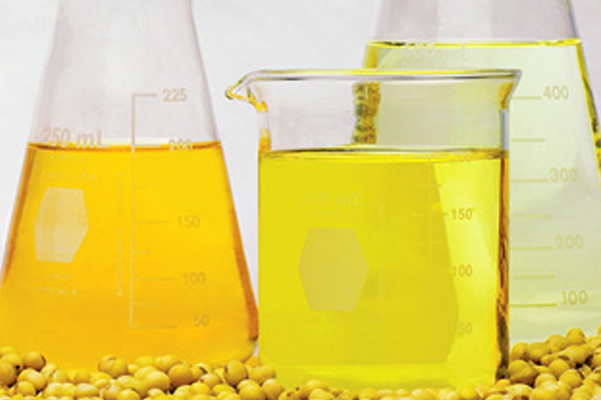 The extracted crude soybean oil is refined, bleached, and deodorized, resulting in clear and odorless soybean oil, suitable for edible and non-edible uses. The remaining defatted flakes are toasted, dried, and ground for use as a protein source for livestock, pets, human food applications, and industrial uses. Soybean meal is the world’s most important source of protein for poultry and livestock. With growing demands for meat, poultry, dairy products, and aquaculture, highly efficient animal feeds are essential for world agriculture. Soybean meal typically contains 44-49% protein and is the second largest livestock feed ingredient after corn. Soybean meal provides an ideal nutritional balance to the amino acids found in corn, sorghum, barley, and wheat—the major grains used in formulating animal feed. In 2014, the U.S. soybean processing industry crushed and marketed an estimated 43.4 million metric tons of soybean meal. More than 12.8 million metric tons was exported, representing 29.5% of the nation’s output, positioning the U.S. as one of the world’s foremost suppliers of soy protein. A further processing refinement, after extraction, produces soy protein for human food use. Soy protein is a nutritionally rich ingredient used in bread, cereals, crackers, cookies, dairy products, lunchmeats, sausage, hot dogs, beverages, soups, sauces, and baby foods. Soy protein improves food nutrition, appearance and taste, reduces shrinkage in cooking, and offers many positive health benefits. Soy flour contains more than 50% protein and is used in many of the nation’s commercial bakeries. By weight, soy flour contains twice as much protein as cheese, three times the protein of meat and fish, and four times the protein of eggs. Soy protein concentrates, prepared from dehulled and defatted soybeans, contain at least 65% protein. They are used in applications requiring water and fat absorption, and as emulsifiers. Soy protein isolates, the most highly refined soy protein products, contain at least 90% protein. Soy protein isolates are used in infant formulas, nutritional applications, and meat and dairy products. Soybean oil is the world’s most widely produced and widely consumed vegetable oil. In 2014, over 20.6 billion pounds were produced in the U.S., with 1.9 billion pounds of that being exported to more than 50 countries. Soybean oil is a significant part of Americans’ diet. It is consumed daily by virtually every American in products such as margarine, shortening, salad and cooking oil, as well as in the commercial frying and baking oils used in food preparation. High in polyunsaturates and relatively low in cost, soybean oil has emerged as the leading vegetable oil in the U.S. food economy. In recent years, soybean oil production has responded quickly to increased demand, becoming America’s number one choice of vegetable oil. Soybean oil is a highly adaptable product, not only for foods, but also for industrial use as an ingredient in paints, plastics, pharmaceuticals, printing inks, oleochemicals, cleaners, and biofuels. Canola belongs to the same family as mustard, broccoli, Brussels sprouts, and cauliflower. Grown in the United States, Canada, and Australia. It is consumed all over the world. While canola’s origins were in rapeseed and the two plants look very similar; they are not the same. Their nutritional profiles are very different. Canadian scientists used traditional plant breeding in the 1960s to eliminate the undesirable components of rapeseed and created “canola,” a contraction of Canada and “ola” (for “oil low acid”). Canola has very quickly become a valuable crop for farmers, processors, and consumers. 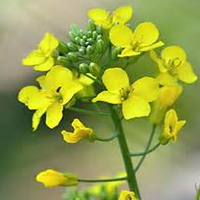 Canola seeds contain about 44% oil. Canola meal is now extensively used as a source of protein for animal feed, while canola oil is used for consumer products, notably cooking and salad oil. Able to withstand very cold climates, most canola produced in the United States is harvested predominantly in North Dakota, but also in Idaho, Minnesota, Montana, Oklahoma, Oregon, Washington, and several other states. North Dakota alone produces over 70% of the nation’s canola crop. In 2014, the U.S. harvested over 1.5 million acres of canola and produced 2.5 billion pounds of canola oil. The flax plant has been cultivated since prehistoric times. Flax, known as common flax or linseed, is a food and fiber crop grown in cooler regions of the world. Flax is one of the oldest cultivated crops, having been grown since the beginning of civilization. Originally grown to make fiber for linen clothing, oil from the flaxseeds is commercially produced today as industrial oil, with oil cake residuals used for livestock feed. Flaxseeds, which yield about 40% linseed oil, are first expelled to remove approximately 50% of the oil. Flaxseeds are then solvent extracted in the same manner as soybeans. Flaxseed production in the United States occurs in Minnesota, Montana, North Dakota, and South Dakota. About 88% of the flaxseed was grown in North Dakota. In 2014, 302,000 acres of flaxseed were harvested, with 6.3 million bushels produced. Safflower is an oilseed crop which has been grown since ancient times in semi-arid regions of the India, Middle East, and Northern Africa, where it was a source of a dye and edible oil. American farmers began growing safflower around the end of World War II. 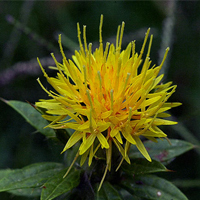 Safflower is a broadleaf, annual, oilseed crop primarily adapted to grow in the western Great Plains. In the same family as sunflower, it is a thistle-like plant with a strong central branch stem and a varying number of branches. Safflower provides three main products: oil, meal, and birdseed. Today more than 60 countries grow safflower, but over half is produced in India. Most of the remaining production occurs in Argentina, Australia, Ethiopia, Mexico, and the United States. In the United States, the two largest producing states are California and Utah. Other states producing safflower include Colorado, Idaho, Montana, North Dakota, and South Dakota. In 2014, safflower production was at 209 million pounds; this is down less than 1% from 2013 and represents the fifth lowest production. The wild sunflower is native to North America, but commercialization of the plant took place in Russia. It was only recently that the sunflower plant returned to North America to become a cultivated crop. It was the American Indian who first domesticated the plant into a single-headed plant with a variety of seed colors including black, white, red, and black/white striped. The sunflower is recognized worldwide for its beauty, it is also an important source of food. There are two types of sunflowers: first is oilseed – small black seed which is high in oil content and is processed into sunflower oil and meal; second type is non-oilseed (confectionery sunflowers), that is a larger black and white striped seed. Sunflower oil is a valued and healthy vegetable oil and sunflower seeds are enjoyed as a healthy, tasty snack and nutritious ingredient to many foods. Sunflower oil is light in taste and appearance and supplies more vitamin E than any other vegetable oil. It is a combination of monounsaturated and polyunsaturated fats with low saturated fat levels. Sunflower oil is valued for its frying performance, and health benefits. Oil is the majority value of sunflower seed and meal is considered a by-product. Sunflower meal is an excellent livestock feed, especially for ruminants (cattle, goats, sheep). 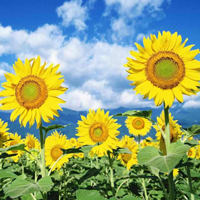 Sunflowers are grown in the United States for cooking oil, confectionary, and birdseed. Sunflowers are primarily grown in North Dakota and South Dakota, followed by Texas, Minnesota, Kansas, and Colorado. In 2014, 1.5 million acres of sunflowers were harvested. The estimate for the 2015 crop year is 1.6 million acres. Many factors influence producers’ decisions to plant sunflowers. Location determines whether sunflowers will be successful. Sunflowers are a short-season crop that allows them to be grown over a wide range of latitudes. The growing season for sunflowers is from June through September, around 90 days. Sunflowers thrive in northern areas, high production states, such as North Dakota and South Dakota, have cooler temperatures and harsh winters that make sunflowers less susceptible to insects and disease. NOPA favors a market-based trading environment that encourages the efficient production of an abundant, safe, sustainable, and high quality supply of oilseeds and oilseed products for domestic and world consumers of food, feed ingredients and renewable fuels.